A great smoothie recipe to start your summer morning! I omit ice, but you can add some in if you would like! All the ingredients are easily interchangeable. Feel free to experiment. The protein powder and nut butter will help make this smoothie filling as well as satisfying. Let’s think outside the summer cube for this one. Watermelon ice cubes! They are a delicious addition to any summer drink. Adding flavor and yummy treat after your drink is gone! Cut watermelon into small cubes. Lay in a single layer on a baking sheet and place in the freezer. Once frozen, store in a freezer safe ziptop bag. Fill a glass with the watermelon ice and pour your favorite beverage over. You are all set for your trip. It may be for business, pleasure or both. Either way, chances are you have checked your bag multiple times and flight status. There is one thing that most people neglect to do, which might be the most important part of traveling. We have all been hungry at the airport and had to settle for an $8 bag of almonds or goodness help us….fast food. Which ultimately leads us to feeling crummy. Not only physically but mentally as we try to justify the expense for things that are just not good for us. Make snacks a part of your planning routine. Your mind and your body will thank you when you’re traveling. Plus if there is a delay or your don’t even get an armrest to use. You can rest assured knowing your fueled up properly and won’t get grumpy. 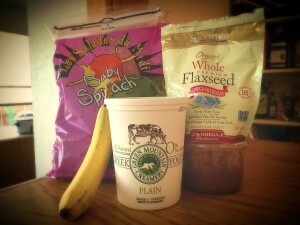 Here are a few of my go to snacks to pack in my satchel. This is a sample. Be creative and chose whole, healthy foods! It’s summer and you can feel it with the 95 degree temperatures! On these days, we mostly crave light and refreshing meals. Keeping with that theme here is a wonderful light and crisp fruit salad. You can substitute any fruit to your liking. Feel free to mix and match to your taste buds! Combine watermelon, strawberries, peaches, grapes and blueberries in a large mixing bowl. 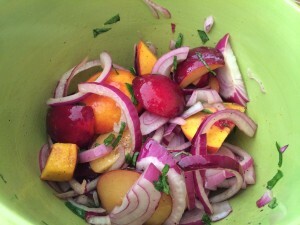 Whisk lemon juice, mint, lemon zest, and honey together in a small bowl; drizzle over the fruit mixture and toss to coat. Today we have a quick and easy recipe that will spice up any dish you choose to make along with it. It is easy and there can be as many subtractions or additions as you want. This makes a great supplement to any summer BBQ or mid week meal since it is so easy to make. 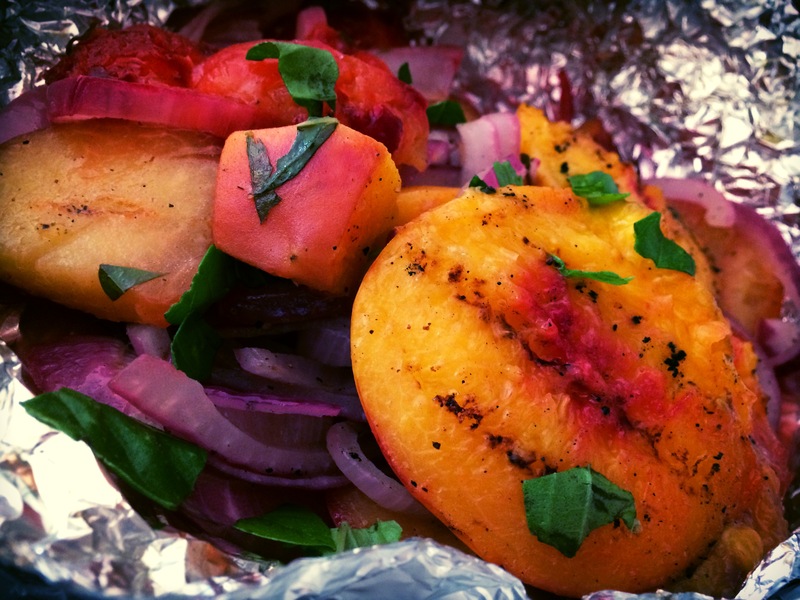 This healthy side dish will make you want to experiment with foil packets every time you fire up the grill! All the ingredients mixed together before they enter the foil packet. 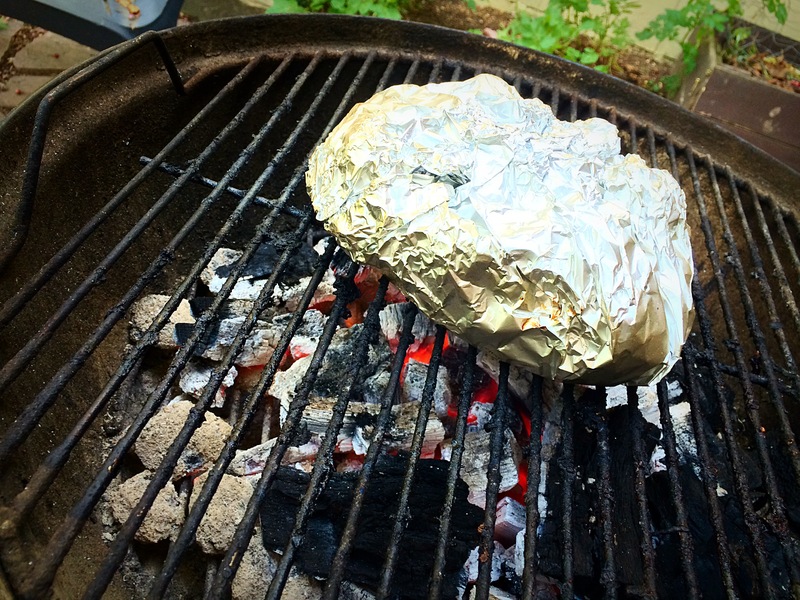 After you have mixed all the ingredients, make a foil pouch. I had to use two big sheets to fit all the ingredients. The grill heat should be medium, if you hold your hand over the coals it should be able to be there for about 3 – 4 seconds before becoming too hot. Cover and let grill for about 10 -15 minutes. Patience please, goodness happening inside. Once it is done, be careful taking it off the grill for it will be hot! You can open up the packet to let it cool for a short time before serving. Feel free to tear a few pieces of fresh basil or thyme to top it all off. Finished product topped with fresh basil. It can be served by itself or along side a protein or main dish to supply a great flavor punch and freshness to any meal! Served with a steak for a light side dish. Serve it up warm and enjoy! It can be tough to have a good breakfast in the morning or even a snack throughout the day. You have to factor in time restraints and portability issues (Looking at you bowl of cereal.) Given all of that, there are still ways to make healthy options available to you and have them prepared quickly. Let’s look at the smoothie. Grabbed from any smoothie emporium they can be loaded with sugar and calories that you didn’t expect. However, making them one your own will let you control the ingredients, save you money and also save you time. The best part here is you can throw anything in and make it taste pretty good. I usually start with a pretty consistent base of ingredients. You get the idea, anything you want! This is a great time to sneak those pesky veggies into your smoothie. See if you can sneak in some to get your daily allotment in early. Just be mindful of the amounts you are using with fruit and milk. If you are not careful you can turn one of at home smoothies into a smoothie chain store monstrosity. This part is pretty simple. Put it all in the blender! I always start with my liquid on the bottom and I do not use ice. Mostly because I freeze the fruit that is in season so I can use it later. If it doesn’t seem to be mixing well, you might need to add a little more water or liquid of your choice. The fun begins! Watch as the colors blend and make an appetizing bright green, red or blue! Or perhaps it has turned a shade of brown….don’t worry that still might taste good do not lose hope! Here is the beauty of it all. If you put a good amount of ingredients in chances are there is about 32oz of smoothie frothing before your eyes. You can dump half of that into your to go cup and deposit the other half in the fridge. Now you have snack for now and other for later, amazing! If you are at work all day maybe pack it all up and drink half now and half around 2:00pm when you just want to crawl under your desk and nap. It will give you little energy boost and be great tasting! For a quick example, say you started with the smoothie starter in the amounts I listed at the start. Then you added a scoop of protein powder and a few handfuls of your favorite fruit. You would be stuffing about 40 grams of protein in that smoothie. Split into two meals that gives your a snack with 20 grams of protein per snack! If you omit the protein powder you will be around 18-20 grams of protein for your whole smoothie. Which is still great. If you don’t do dairy, don’t worry. Any favorite protein you have can be added in and the yogurt just gives it a touch more thickness. So you won’t be losing too much there. What are some of your favorite smoothie concoctions? We would love to hear about them and try them out! Tweet me or leave a reply! 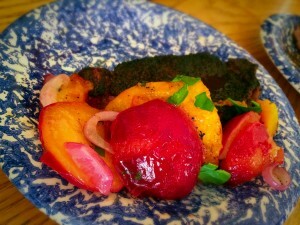 The more ideas we have in our arsenal the better tasting our meals and hot summer days can be!